Doom (typeset as DOOM in official documents)is a 1993 science fiction horror-themed first-person shooter video game by id Software. It is considered one of the most significant and influential titles in the video game industry, for having ushered in the popularity of the first-person shooter genre. The game is divided into three nine-level episodes. The Ultimate Doom, an updated release of the original game featuring a fourth episode, was released in 1995. 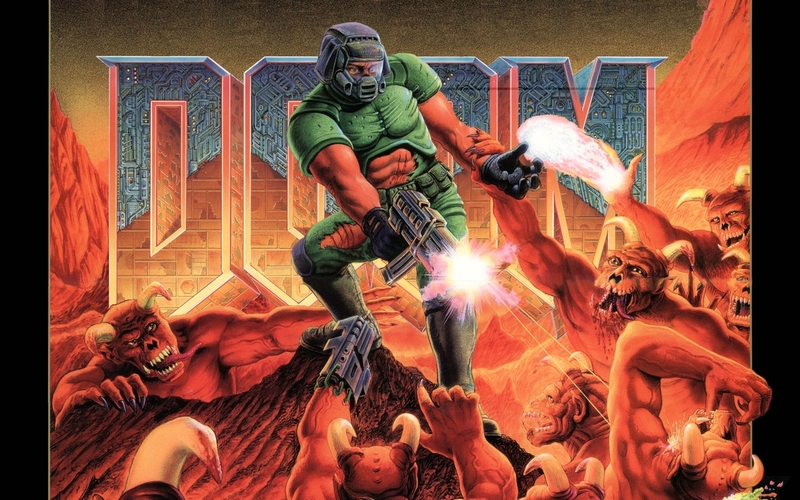 In Doom, players assume the role of a space marine, who became popularly known as "Doomguy", fighting their way through hordes of invading demons from Hell. With one third of the game, nine levels, distributed as shareware, Doom was played by an estimated 10 million people within two years of its release, popularizing the mode of gameplay and spawning a gaming subculture. It is widely known as one of the most important video games of all time for having popularized the first-person shooter genre, pioneering immersive 3D graphics, networked multiplayer gaming, and support for customized additions and modifications via packaged files in a data archive known as "WADs". As a sign of its effect on the industry, first-person shooter games from the genre's boom in the 90s, helped in no less part by the game's release, became known simply as "Doom clones". Its graphic and interactive violence however, as well as its satanic imagery, also made it the subject of considerable controversy.